In a grand finale to the season of warbler migration, flocks of yellow-rumped warblers fill the trees. In perpetual motion, they harvest wild grapes and other small fruits to fuel their migration. This bird is beautiful in fall, but it's more impressive in spring, when it has black breast patches and a dramatic facial pattern. The challenge to the beginning watcher of warblers is to recognize this muted beauty as the same bird as the colorful, singing spring male yellow-rump. Of course, the trick with all warblers is to look for them when they are where you are! You can't see any warblers at all when there's snow on the ground. One reason that yellow-rumped warblers are still around after most other warblers are gone is that yellow-rumps are adaptable enough to eat grapes and other small fruits. 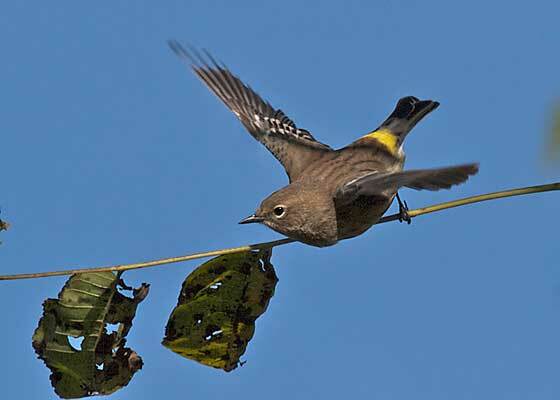 Most warblers depend more completely on insects, which tend to disappear in cold weather. Here a yellow-rump plucks grapes high in a tree. If you still have warblers, enjoy them now! This book lets you identify all the birds in North America. Helps get clear on confusing fall warblers.